KWPN, Holst., Den., SWA, SF, Unire, Hann. A top pedigree with a sire line of the highest quality stallions. Corland’s dam is one of the best Holstein breeding lines: number 104 A. Out of this direct line is Retina, who won the Hamburg Derby twice. His international career with W.J. van der Schans was very successful. Corland has placed 4th in the Grand Prix of Oslo, 6th in the Grand Prix in Helsinki, 5th in the Grand Prix in Bordeaux, 4th in the Grand Prix in Den Bosch, 2nd in the Sires of the World competition in Lanaken, 5th in the Grand Prix in Maastricht, 7th in the Grand Prix in Zuidlaren, 7th in the Grand Prix in La Baule, 2nd in the Grand Prix in Rotterdam, Champion of the Benelux in The Hague, 7th in the Grand Prix in Calgary and 7th in the World Cup in Verona. At the European Championship of 2001, Corland proved to belong in the category of the best in the world. He won both qualifiers and had the best results of the Nation’s competition and had the fastest clear round in the qualifying speed class. In the finals, he finished in 9th place. Corland jumped convincingly over the heavy courses and showed what he is capable of. His progeny perform well. His sons, Pacific, Sir Corland and Santa Cruz, were approved and Champions of their Stallion Tests. 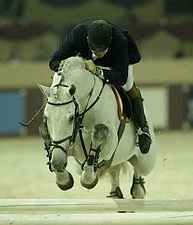 In 2006 his son Waterford became Reserve Champion at the Stallion Selection Show, his daughter Carlanda became Dutch Champion of the Young Riders and daughter Little Miss won the British Young Rider Championship. 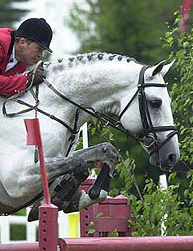 His son Oracle was the USEF Hunter Champion of the Year in the USA. Torlando became 3rd in the Championship of 6 years old horses of Brazil. 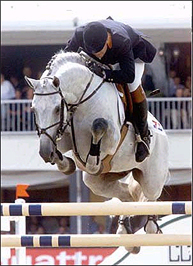 His daughter VDL Pendence had the highest EPTM [mare test] of 2001 with 87.5 points; his son Cor de Son won the World Championship in Lanaken for 5-years old jumpers; his daughter Universe Miss was Dutch Filly Champion and daughter HBC Dancing Queen was Dutch Champion of the 6-years old jumping horses. Corlanda FZ won a big championship for 4-years old horses in Italy and Relance became 4th in the West Coast Championship for the 7 & 8 years old jumpers of the USA. Daughter VIP was first at the NAWPN Top Ten for free jumping in the USA. Also at International level his offspring are breaking through and are winning several classes: Pracht S won two Grand Prix in the USA and daughter Marlo won the Grand Prix of Vermont. Santa Cruz VDL became reserve Champion at the Open Scandinavian Championship for 6-years old horses. Also Torlando, Broere Pacific, VDL Rocksina, Picasso, Relance, Spring G, Sir Corland, Senator VDL and Oliene were winning and have many high placings. Corland is the nr. 3 sire of Hunter breeders in the USA. 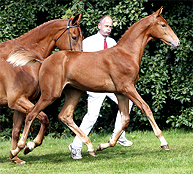 Corland has proven, by his own performance, and with that of his progeny to be a treasure for the breeding community.